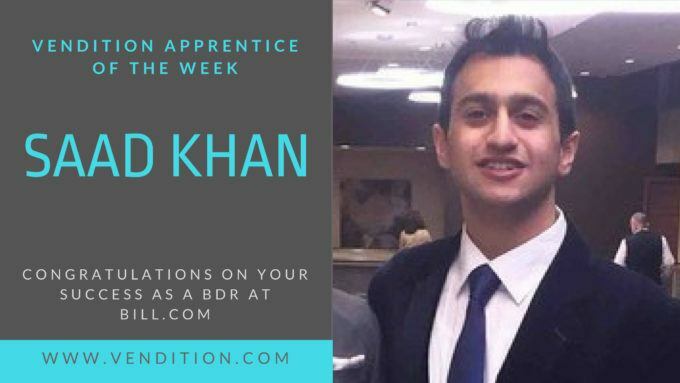 This week, we recognize Saad Khan at Bill.com as Vendition’s Apprentice of the Week. Since July, Saad has hit 140% of his quota for Q1 and helped with onboarding new teammates coming onto his BDR team. No doubt he will continue to accelerate as a BDR with Bill.com! Saad graduated from San Diego State University in the spring with a business degree in finance and was looking into opportunities pretty strictly in the SoCal area. When introduced to Vendition and the opportunity at Bill.com, Saad found the right fit and moved back home to the Bay Area to take on this role. “I studied finance, so initially I was more so looking at finance-related jobs. What I had decided just a few months before I started working with Hailey [and Vendition] was that I would pursue sales if it was with a company that resonated with me and a product that I could get behind. “Bill.com was the most interesting opportunity to me, so when Hailey and I started working together, I asked if we could focus there. I went in for the onsite interview and connected well with the three or four people I interviewed with, so it was a no brainer. “Since I was about to graduate, maybe a few months before, I had gone through one round of interviews first–and that really taught me a lot for what to expect for a sales interview process. While I didn’t necessarily feel like I came in with a competitive edge, the hiring manager I worked with at Bill.com basically told me ‘they’re good people over there’ at Vendition, so looking back having the backing did help. “Day one I came in and having had only one business development internship selling a product that wasn’t something I was passionate about, I was looking to start fresh and learn how to sell. Between starting to now, what’s mainly changed is that initially I felt like I was calling these people and trying to talk to them about a product I thought they weren’t interested in. I felt like I was annoying and bothering these businesses. My mindset shifted after a month in, and now I know I’m really calling them to help them and their business on a day-to-day basis. Our fiscal year starts in July, when I started, and I ended the first quarter 140% of quota. Ashleigh coached Saad on trying to relate to people when he first called them and to do some research on each person he called so he felt more comfortable. Since Saad started, his manager has sent him to the QuickBooks Connect conference (as the only BDR from Bill.com, as well), and he’s been dealt the responsibility to create an outreach sequence for the CFO persona for his team. Keep up the great work, Saad! We know there’s so much more in store for you at Bill.com, and we can’t wait to see it.